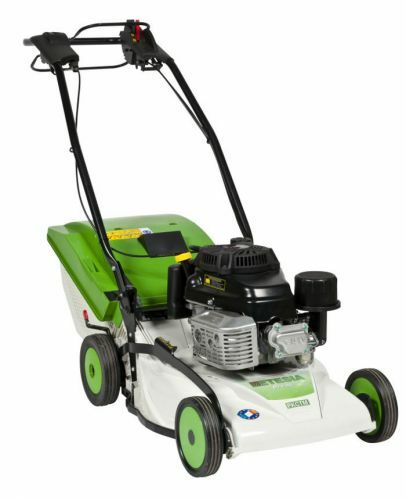 The new range of PRO 46 Evolution mowers are extremely versatile and are capable of mowing with or without collection in all conditions, or allowing high-quality mulching. And they do all that with no need for an accessory! (Mulching insert supplied). This high performance is possible thanks to the Duocut concept which combines 100% collection and 100% mulching decks together – all without compromising the results of either of the functions. It offers a very high collection performance because the grass is crushed finely - even if it is long and wet. The grassbox is always filled to capacity. Changing the mowing system is easy: just place the removable insert under the deck if you want to mulch. Remove the insert if you prefer to mow - with or without collection. There is no need for a tool or blade change. The insert completes the shape of the deck to form a smooth surface with no roughness, allowing the grass to move easily for incomparably superior mulching. 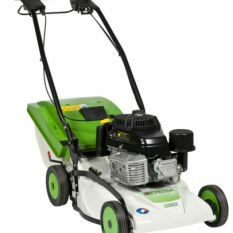 The Etesia PRO 46 PHCT is the Honda single speed model. Mulching or Conventional mowing with or without collection - It's up to you. That high performance is possible thanks to the Etesia Duocut concept which is the perfect combination between 100% collection and 100% mulching decks, without compromising the results of either of the functions. Changing the mowing system is easy: just place the removable insert under the deck if you want to mulch. Remove the insert if you prefer to mow with or without collection. No need whatsoever for a tool or blade change. The insert completes the shape of the deck to form a smooth surface with no roughness, allowing the grass to move easily for incomparably superior mulching. Excellent mulching results; (the grass is crushed very finely) and a very high collection performance because the grass is crushed finely, even if it is long and wet. The grass is compacted in the box. 56 litre rigid collection box complete with filling indicator. Slopes < 18% or 10°.